There was a lot of controversy on Twitter this weekend after one troll who works at an expensive private school overseas boasted that they let their students “go to the bathroom” whenever they wanted. A teacher at a state secondary ended up in a Twitter storm for pointing out why this is not allowed in their school. A lot of what followed was just the usual teacher-bashing and trolling you get on edutwitter from people who would never work in a tough school. But some non-teachers genuinely didn’t understand what the issue is. I said I’d write a post explaining, only to remember I wrote this one ten years ago. I’ve added some updated remarks at the end. Teachers will be entitled to positive support from parents to promote good attendance and sound discipline. Schools suffer from unruly and disruptive pupils. Exclusion or suspension may sometimes be necessary. We will, however, pilot new pupil referral units so that schools are protected but these pupils are not lost to education or the country. Unfortunately, once in government, ministers listened to the education establishment, and before long attitudes to discipline moved in the opposite direction. In particular, the policy of “inclusion”, which was meant to be about providing provision in mainstream schools for disabled students and students with SEN, started to be used to justify keeping badly behaved children in school and in lessons. I have a strong recollection from my second year of teaching, back in 2003, of a senior figure from the local authority coming to my school at the start of the year and explaining there would be no permanent exclusions in Coventry that year. Under the Tories, parents would no longer have the right to an external appeal to challenge headteachers’ decision to exclude their child. They would only be able to appeal to school governors rather than local authority-run independent appeals panels, as under the present system. The move is in response to fears that growing numbers of ill-disciplined children are being allowed back into school because parents know how to “play the system”. The Tory leader, David Cameron, will say that teachers do not have the powers they need to keep order. “The problem doesn’t lie with teachers – it lies with the rules and regulations which stop teachers imposing proper discipline,” he is expected to say. Changes were made after the Conservatives entered government, and the rate of permanent exclusions did go up as planned and, in my experience, schools became safer. The increase in permanent exclusions was a bad thing. Rather than being a result of deliberate government policy, it must be due to some other new development in schools. Schools needed to be told that permanent exclusion is a last resort. And these assertions seem to go unchallenged repeatedly. There are, of course, other issues around the fairness and appropriateness of permanent exclusions and I will return to some of those. But the basic principle that every school should be a safe school is one we should stand up for at a time when it’s under fire from those who care nothing about the victims of extreme behaviour in schools. I’ve talked a lot about “school shaming” where schools, particularly those with more traditionalists approaches, are subjected to campaigns of online intimidation and abuse, negative media coverage and vexatious FOI requests. As well as bogus legal threats, online abuse and school shaming campaigns, I’ve also began to notice the use of spurious complaints to people’s schools and universities for expressing the wrong opinions. Unfortunately, most of the victims of such behaviour cannot go on the record for fear of the consequences. Bloggers who are generally uncontroversial have been told that they must stop blogging. At least one anonymous blogger was forced to quit their job after their identity was revealed to their employer. One teacher told me their headteacher had received letters of complaint, that were initially acted on, just for recommending my blog on Twitter. A few people were able to talk about their experiences publicly. When I was asked by the DfE to lead behaviour reviews, that’s when the Angry Brigade really got their engines started. Now I consider it a quiet day if someone isn’t firing off bitter, poorly spelled tweets that mysteriously include the handles of the DfE, Secretaries I’d State etc. I’ve even had venues I’m holding researchED in harassed because lonely keyboard warriors feel compelled to make their internal struggles with joy a public issue. It’s largely fine- when you become part of a lively and public discourse, you expect pushback. But the tactic of ‘I’ll tell your boss’ is rather weird if the reason is simply ‘I disagree with you.’ That’s simply an attempt to shut down debate through intimidation. Happily I’m self employed, so my boss is unlikely to sack me. My favourite incident was when someone emailed researchED (which is me) and told them to sack me. …a number of Australian academics complained to my university. As I understand it, the complaint was about me making fun of the Australian Association for Research in Education (AARE) conference. Specifically, I joked about how some of the paper titles sounded silly. The complaint was thrown out because I didn’t claim to be representing my university when making these comments and because I am allowed to have opinions about education. My boss told me that she got “warnings” not to employ me in my new role when I updated my Twitter with my new role. Along the lines of “do you know who you’ve just employed?” with links to lots of Michaela stuff. As it happened, my boss was on Twitter so understood the venom, and was herself at a highly criticised new school so she just found it funny and ignored it. Also, I had been at Unlocked for a while before I put it on Twitter. But I dread to think the effect it could have had if that wasn’t the case. … call the school office and headteacher on a weekly basis for two months, still threatening to call in the police and go to the media because of my supposedly disgraceful behaviour. Worst of all, this person knew the effect of they were doing, making references to wanting the principal to prioritise their complaint over improving the life chances of 350 “poor” children, and threatening to “drag the school through the mud”. This was not a dignified phone call asking for the headteacher to make up their own mind and be trusted to take appropriate action. This was the offline equivalent of endless Twitter hectoring. Ironically, our principal did also consider going to the police to make it stop. I’ve no reason to think that there are more than a handful of people doing this sort of thing. There may be some overlap in those whose actions are described above, or some overlap with people whose actions were described in my other blogposts on silencing traditionalists. But what is clear is that, if you are unlucky, expressing educational traditionalist views can be enough in itself to lead to retaliation. This is a follow up to this post, and is the second of three posts about attempts to silence educational traditionalists online. In the last year or two, I have seen an apparent rise in the use of legal threats against educational traditionalists. It’s probably worth bearing in mind when reading what follows that, legally, something can only be defamatory if it is untrue. Or at least that’s how I understand it, but obviously don’t take my legal advice, I’m not a lawyer. Opinions, even insults, are not defamation if they do not make false claims. The blog is defamatory and posting libel via social media (The writer has linked to this blog post on Twitter), or anywhere else, can have consequences. I have *never* in any of my many inspections transferred any bias (I have none, regarding teaching methods, have developed the hashtag #nobestwayoverall which supports that and I support ‘Trad’ teaching, in context. There is valuable methodology in ‘trad’.) into any inspection I ever led, or in which I was a team member. 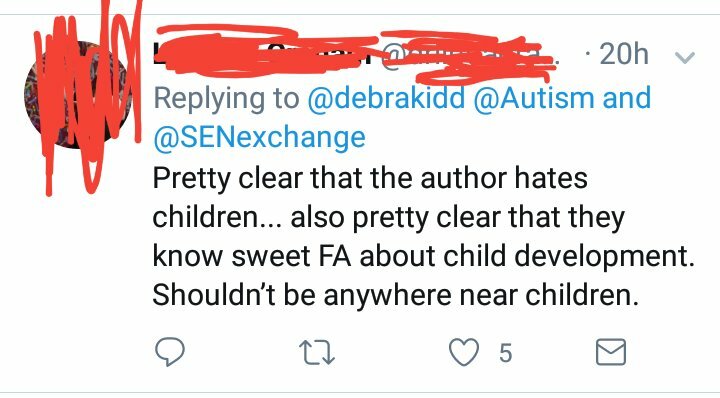 This is simply a personal attack to support the writer’s belief that Ofsted inspectors transfer anti-‘trad’ views to inspection and he’s picked on me to try to illustrate that, as I don’t believe ‘Trad’ is the best way overall. I would like this blog to be removed. If the author would like to contact me by email, or by DM on Twitter, we can sort this amicably; or he can delete the blog. Repeated requests to identify any actual falsehoods in the post did not get anywhere and no case was brought. Another progressive claimed “I’m investigating the potential for defamation in his actions” when Greg criticised project based learning. Again, no case was brought. Teaching Newbie was then told in her blog comments by one of the bloggers and by a PGCE tutor (who she didn’t know personally) on Twitter that she could be sued for defamation. This threat was ridiculous, but the PGCE tutor was insistent telling Teaching Newbie she had put herself in “personal danger”. You cannot be sued for disagreeing with people, but she removed the name of these two bloggers, while refusing to remove her own opinions. When this failed to silence Teaching Newbie, the PGCE tutor then told Teaching Newbie that bloggers could be easily identified; that her context was “identifiable”, that her ” blog and identity can be easily traced”. Given the context of the conversation, this was intimidating enough for Teaching Newbie to delete her Twitter account and blog. If you had the slightest concern of in any way inciting or being privy to inciting a witch hunt surely you could have been laying yourself and others open to criminal charges. I have spent much time in the last days seeking legal/police advice. If you continue to accuse me of bullying which is a highly serious accusation, without substantiated evidence I will contact my local police. I have no qualms about doing this. … So your accusations of bullying have no substance and I construe them as malicious in an attempt to damage me. As I say it is your choice if you truly and legally stand by your accusations. Otherwise I shall contact my local police shortly. I am following professional advice here on dealing with on line attack. This is not bullying but my legal right to defend myself against unfounded allegations. We all know that the advice given to people in this situation is to inform the local police. Again, where threats of legal action were mentioned, I asked for details of anything I had said that was factually wrong and got nowhere. While I understand that the writer of the intimidating comments claims they were just giving friendly advice, they were not interpreted as such by Teaching Newbie. Teaching Newbie had not asked for advice from somebody who had previously supported threats to sue her for defamation and had apparently taken the time to identify Teaching Newbie and work out what harm revealing her identity might do. I dismissed the legal threats and threats to contact the police and thought that would be the end of it. I even joked about it. It seemed to me the main claim in the letter, that “It is clear from your comments that you were not just accusing our client of engaging in bullying behaviour but you also accused our client of being a bully” was false. As a teacher, I’m very familiar with phrasing things so as to describe a child’s bad behaviour rather than labelling the child as bad. But I’m not a lawyer, and believing something is false and proving it in court is not the same thing. So I contacted a solicitor recommended by somebody I knew from Twitter, and paid for them to respond on my behalf. I’m not saying the reply my solicitor sent was dismissive, but it began by describing the original complaint as “bemusing” and ended by suggesting that if she really wanted the consequences of bringing an unfounded claim “your client should issue proceedings forthwith”. The only response received through official channels claimed “our client is ….currently considering her further options in respect of this matter” and that was the end of the involvement by lawyers. Some pretty strange stuff appeared on social media afterwards. Really strange. Some of it was still threatening. A lot of it was just silly. Narratives appeared in which sending me legal threats was an act of great heroism. My favourite version of the story was the conspiracy theory in which my lawyers acted for free (they didn’t) because of their mysterious connections to an online publication. All I know is that one edutwitter progressive thought it a great idea to tell a part-time teacher earning £21 grand a year that, unless they deleted their opinions, they could face legal action which could cost tens or hundreds of thousands to defend against. They also thought it okay not to withdraw the threat or apologise but instead leave the teacher with the worry that it could be carried out at any time. And they did so because they were so offended at the suggestion they were the sort of person who made threats to silence teachers. If I hadn’t thought and said that before, I can certainly say that now. If you have worked in secondary schools, particularly in maths and English, you have probably heard gossip about that feeder school, the one whose kids come through with KS2 results that seem too high and this kid who went there told a TA who told a teacher, who told another teacher, who told you that there was some kind of cheating going on. I’m inclined to be sceptical about these stories. I’ve heard the same story exactly about too many very different schools. More importantly, while there are definitely kids whose KS2 results massively overstate their abilities, there are also kids whose results are massively understated too, and we tend not to remember those kids quite so clearly as the kid we put in top set maths who does all their working out on their fingers. Inaccuracy alone is not evidence of cheating. A few weeks ago, Education Datalab wrote a post about Difficult questions about some schools’ Key Stage 2 results which you should probably read before continuing. This is a real example. The secondary school is in an Ofsted category, criticised in its latest inspection for the progress of its most able pupils. School H is rated outstanding. We need to ask difficult questions about the Key Stage 2 results of School H.
Was it really the case that pupils performed at such a level at School H that they simply could not maintain their progress at secondary school? Could they have received additional assistance when taking their KS2 tests? Does test security need to be improved? I think the blogposts I linked to earlier make a good, if anecdotal case, for improving test security, regardless of this set of data. However, the question that fascinates me here is whether the data does suggest children at school H have received additional assistance, or show any other kind of rule bending or cheating has taken place. And I’m going to answer “no”, at least not without further data. I think that if a school is very effective, doing all the right things and not cheating, children will achieve better than expected. However, I’m not sure we should expect them to continue to progress well. Academic achievement is a mix of what a child brings to a school (and I’m not going near the issue of the extent to which that comes from nature or nurture) and the teaching and support in the school; both “in school” and “out of school” factors. A highly effective school will get good results from kids whose “out of school” factors would normally lower their achievement. But the negative “out of school” factors will still exist, and yet their results will see them compared with students who will achieved those same results with only positive “out of school” factors. You would expect them to do less well than other students with the same Key Stage 2 results because you would expect those “out of school” factors to affect their achievement in their secondary school. There’s also room here for some kind of regression to the mean as well, although I’m not going to suggest how that would work. It is well known in education research that the effect of educational interventions “wash out” (i.e. the relative educational gains will be far less the longer you wait before measuring them). I think the effects of great primary schools will also “wash out” over time. I think there is a general problem here with controlling by results from a previous school that needs to be addressed. We should expect some degree of “washing out” for the effects of highly effective education whenever we control for prior results, and we need a way to predict it. And by the way, this is not the first time I’ve seen this problem. I’ve also seen people use A-level results as a control when considering how students from different types of school do at university and conclude that comprehensive students do better at university than students from grammars or independent schools. Again, a “wash out” effect for the advantages of selective or private schooling, could explain such data. Controlling for previous results is not straightforward if the same results can have different causes for different children. And so to conclude, interpreting education data is complicated and we probably know less than we thought we did. Teacher Tapp is an app that surveys teachers every day. While those who answer are self-selecting so it is probably not completely reflective of all teachers, it’s probably going to be biased towards the more informed teacher, rather than the less informed. This makes the following result (reported here last week) somewhat concerning. That’s an overwhelming vote in favour of learning styles. This is a shock. A rough summary of the situation is that there is no good research evidence for any learning styles, the most famous types of learning styles are known to be based on pseudo science, and there is still a significant unclaimed reward available to anyone who can demonstrate that learning styles work (details here). In recent years, although there have remained a handful of true believers on edutwitter, it’s been almost a given that nobody believes in learning styles. I’ve seen traditionalists attacked for daring to point out something so outdated or irrelevant. It’s been described as an easy target and a non-issue that people only raise to signal their own virtue, not a live issue in teaching. And now we see this. Of course, as was the case with my last blogpost, people who have turned out to be wrong, and people arguing for something that’s without evidence, will always declare unambiguous statements to be ambiguous or find ways to dismiss or attack those who are interested in the truth. Here are the main excuses given for why this result about learning styles isn’t an embarrassment to the profession. There’s good and bad learning styles. Like most pseudo-science, the first line of defence is to suggest that’s what has been discredited is completely different to what’s actually still being promoted. And so, there’s been a lot of claims that while the bad, old VAK learning styles may have been discredited, there’s no problem accepting that there may be some new theory of learning styles out there that it’s okay to believe. In the same way one might argue that newspaper horoscopes might not work, but there are still expert astrologers out there who can tell you your future. Of course, nobody can prove that a theory too new or obscure to be tested has been shown not to work, but the burden of argument is on those who put forward new theories of learning. If they haven’t, even with a prize available, then there is an obvious explanation: the theory is not true. They didn’t actually mean “styles”. For those who really like learning styles, but know they’ve been discredited, there has been a tendency to say one is talking about “learning preferences” instead before saying all the same things again. This is the same trick use by anti-semites, who replace the word “Jew” with “Zionists” before expressing all the same prejudices. Of course, people probably do have learning preferences. They might prefer to learn one way and not another. But this is pretty much an irrelevance if you want somebody to learn effectively. In fact, indulging those who want to learn in an ineffective way might be actively harmful to them; it might develop bad habits that prevent learning in the future. We all know kids often have preferences that damage learning. Think of the kids who revise by covering their book in highlighter pen rather than by self-quizzing. Think of the child who “cannot write” unless their book and their entire body is turned to face their friends (and it is always to face their friends, they never have the same need to face the wall). It just means children are different. If one is caught making an indefensible statement, it is best to redefine it as a truism. Of course children are different. They different in knowledge, behaviour, personality, and working memory capacity. But, all theses things can be used to some degree, and under some circumstances, to make reliable predictions about learning. The point is that nobody can make reliable predictions about learning based on learning styles theories. If we want teachers to look at differences that matter to learning rather than those that don’t, we can’t simply redefine the latter to be the former. But what about…? I guess this is down to the fact that a politician shared the results above and said they were “concerning”, but loads of people suddenly found a strong desire to discuss every possible educational issue other than learning styles. This is a bit of a test of what people think the education system is for. If it’s about getting kids to learn, then widespread false beliefs about how we learn should be very concerning. If it turned out doctors were trying to treat cancer by finding the correct balance of the four humours, nobody would say “Who cares? The real issue is NHS funding”. It is only because many of those involved in education, don’t see learning as central to the purpose of schools, that people will can dismiss this as an unimportant issue. If it doesn’t matter what teachers believe about teaching and learning, then we aren’t teachers. If people are to be paid as professionals, we expect professional expertise. Teacher professionalism has become a bit of an issue lately. A lot has been written about whether teachers need new organisations, more training, or a different career structure in order for teaching to be more professional. Here’s my suggestion: How about we actually train teachers in the facts about learning, not the myths, and don’t let them qualify without passing a test about this? When I trained to teach, I had to sit a skills test assessing that I knew how a spreadsheet works, but nobody ever checked I knew how learning worked. You are currently browsing the Scenes From The Battleground blog archives for May, 2018.